The Basque Country is probably the most famous culinary area of Spain, with its high propensity of michelin starred restaurants, and it is no surprise that its cuisine has now begun to hit the London scene, which I am so glad about as I have yet to travel to that part of Spain and so am thrilled to be able to finally experience it for myself. Chef Eneko Atxa is originally from the Basque Country and is famously known for being awarded 3 Michelin stars for his restaurant called Azurmendi in Larrabetzu, which is high on my bucket list. Thankfully, he now also has a restaurant at the hotel One Aldwych in Covent Garden, named after himself, where he showcases his fresh modern Basque dishes to us lucky Londoners. He happened to be in the country on one fine evening and we were invited to go for a meal cooked by him at Eneko. As we arrived at the entrance of the restaurant, the architecture and design of the restaurant was fabulous, with a striking copper staircase and exposed steel building framework. We had arrived on the first floor which housed a gorgeous bar, and then went a floor below down the copper staircase to the restaurant itself, with its very modern and lush interiors inspired by his Basque heritage and commissioned to Cassson Mann to design. What strikes me most is the sense of space inside the restaurant and it looked ultra modern, and I truly felt like I was on holiday in Spain. We decided to have some cocktails instead of wine, as it was a particularly hot day and we had bravely walked from London Bridge to Covent Garden in 30 degree sunshine. These were so refreshing – a blend of chilled Cava, lemon and sugar syrup. Chef Eneko came over himself to talk us through the menu and our dietary requirements and proposed that he would select some dishes from the menu himself so we could try a variety. We were not going to oblige as the menu already looked so good that narrowing down dishes would have been a difficult task! Besides who better to order than the man himself, who was so lovely. A bread basket arrived alongside a lovely basil and sea salt butter, served in a vessel similar to that of a pestle and mortar. I am a butter fan and this was a very refreshing flavour, although I knew to only try a little as I sensed there was a lot of food to come. Soon the Amuse bouche arrived which pretty much set the scene for what we could expect for the rest of the meal. These were served in a spectacular way, hanging from a miniature tree and were white chocolate balls filled with white rum (always a winner for me), zesty passion fruit, lemon juice which had been infused with red tea. With two each to indulge in, we thoroughly enjoyed these chilled refreshing and tropical mouthfuls and adored the presentation with its unique and flamboyant fare. Next dish that arrived was from the starter selection and is quite possibly the prettiest dish I have ever been served and my favourite of the evening. 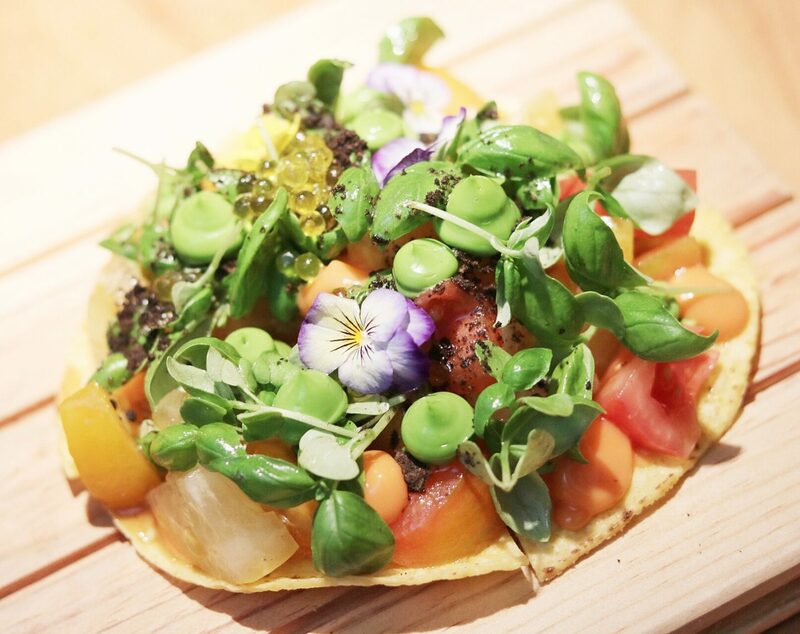 This was a Traditional Talo which is similar in texture to a tortilla, and made from Crispy corn, topped with colorful heritage tomatoes, a basil emulsion (which looked like little caviar), basil leaves and edible flowers. The entire dish tasted so fresh and I just loved the flavour combination and the amazing aesthetics to this starter. Avocado Tempura was next to arrive on the table mixed with a Basque red pepper sauce and basil emulsion, and also served as a work of art, with pretty little flowers garnishing the top. I love avocado and this tempura was sensational. Cauliflower in Textures, was essentially a genius dish where Cauliflower was presented in four different ways in one dish. I cherished this dish slowly and it was the perfect comfort dish – the type you would long on a hard day. Mains were up next and the first of our mains was a Wheat Stew infused with Truffle and topped with egg yolk, which we broke to mix into the dish. Great fun! It was a really flavoursome dish and we had slices of baked bread to scoop it up with. My favourite of the two mains was the Seared Duck Breast with a Julienne of king oyster mushrooms and pickled red onion. I revered in the variety of flavours and textures in this dish and this is a must order! If the dishes so far were anything to go by, we knew we were in for a treat for dessert and we were not wrong. From the menu we made our choices, and sat patiently and eagerly to see what would arrive. First my Salted Caramel Mousse with Cookie crumble and sheep’s milk ice cream was presented before me and I was already in heaven. It was like art on a plate and it tasted ridiculously satisfying too. However, Aftab got the envious dessert of the evening. What sounded so simple on the menu – a Rose marshmallow with a Strawberry sorbet was served in a theatrical way complete with smoke, his own rose and a beautifully sweet treat, with the sorbet served on a fluffy soft cloud like marshmallow. He was in heaven. We thoroughly enjoyed our meal and especially the beautiful artistic way in which Chef Eneko proudly presented each of his dishes, his choices of flavours to entice us with and left us feeling very spoilt and very content. If you haven’t been to Eneko yet or are yet to try Basque cuisine I can’t recommend Eneko at One Aldwych enough – it will blow your mind, from the swish interiors to the sensational food and it totally won’t surprise me if it gets a Michelin star soon.